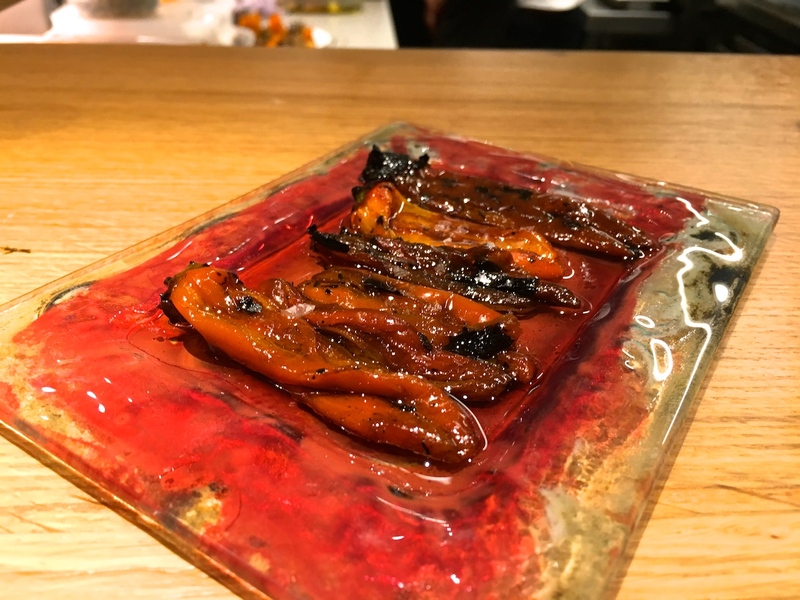 Dos Pebrots (two peppers) is the second restaurant of chef Albert Raurich, well-known as the former Chef de Cuisine (2000-2007) at elBulli. Raurich opened his first restaurant Dos Palillos (two cocktail sticks), a Spanish-Asian tapas bar, in 2008, followed by the opening of Dos Palillos in Berlin in 2010 (now closed). 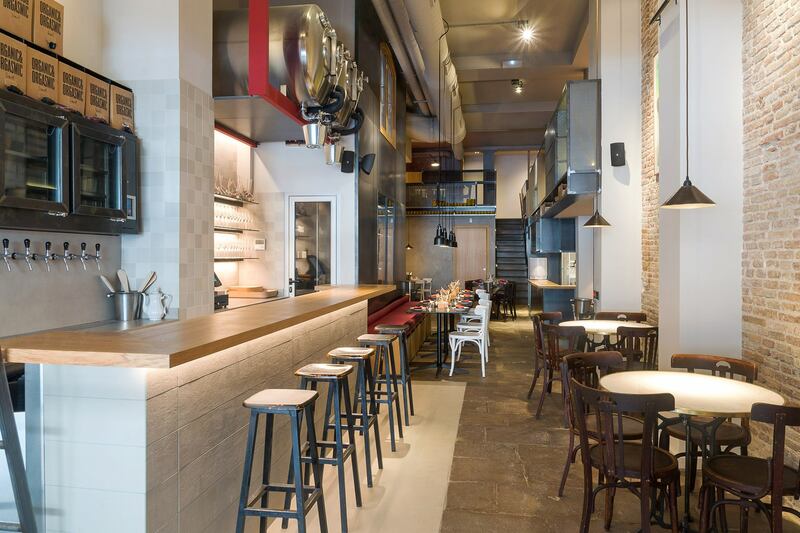 Dos Pebrots opened its doors in September 2016, with chef Borja García Ordoño at the helm. For the menu of Dos Pebrots, Albert Raurich and Borja García Ordoño researched historic cuisines, recipes, ingredients, and cooking and preservation techniques, from ancient Rome, Greece and Persia to medieval Catalonia, but they also studied the origins of classic dishes (e.g. cod pil pil apparently originated in San Sebastián in 1929). All this research is reflected on the menu, which lists a broad selection of good-sized tapas, including a number of re-imagined historic and/or classic recipes. Each dish on the menu is accompanied by a summary of the ingredients used, the cooking techniques employed (e.g. marinated, fried, emulsified), and the origin/history of the dish/ingredient (e.g. the potato arrived in Catalonia in 1560). Also featured on the menu is a fun, informal instruction on which utensil to use to eat a certain dish (e.g. forks, hands, wooden spoon). 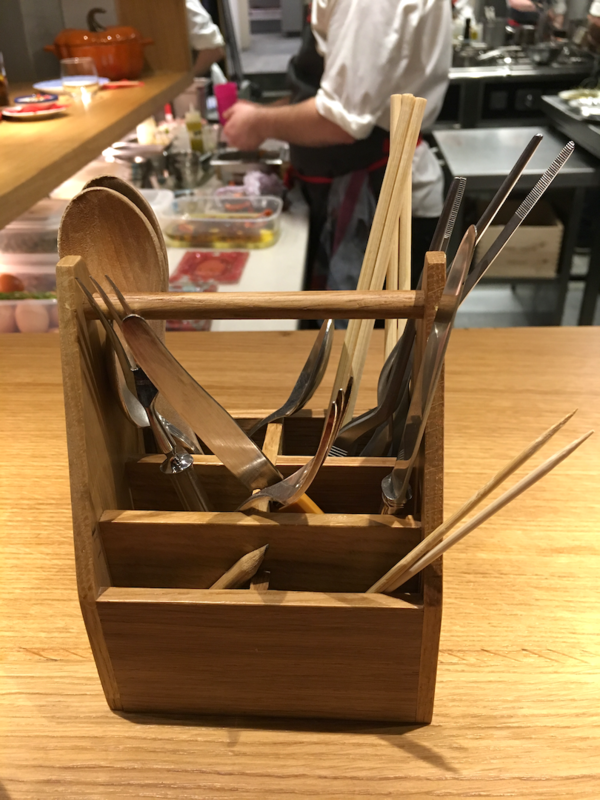 Wooden utensil holders are placed on all tables and on the bar. Dishes are priced between €4.00 and €18.00 and Dos Peprots has three ordering options: "not really hungry" (4/5 dishes), "normal" (7/8 dishes) or "starving" (as for the whole menu). Dos Pebrots is open for dinner Wednesday through Sunday and for lunch on Saturdays and Sundays. I had dinner with my husband at Dos Pebrots in February 2017 and we shared 10 dishes. 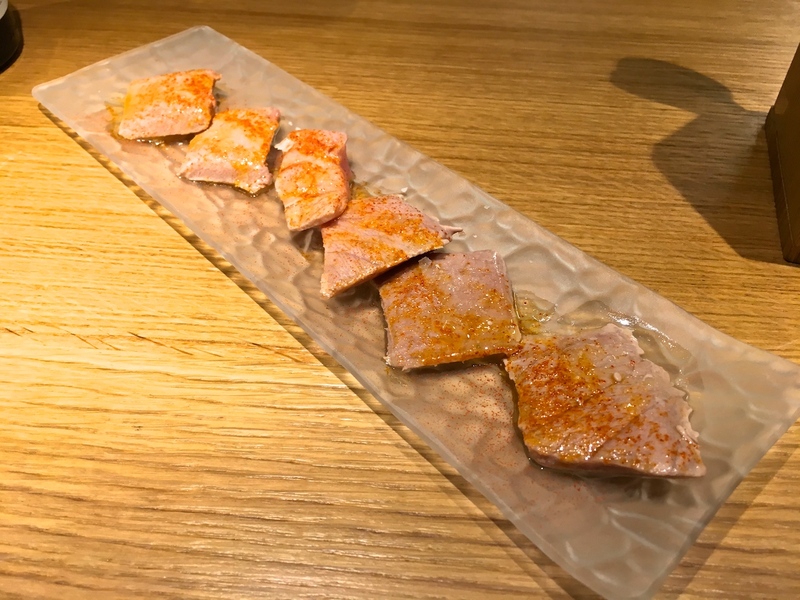 First to arrive were slices of tuna belly (preserved in olive oil) seasoned with sea salt and smoked paprika powder, and a bowl of langoustines served with olive oil and thinly sliced deep-fried garlic, which (once peeled) revealed beautifully pink little morsels of juicy sweet flesh. 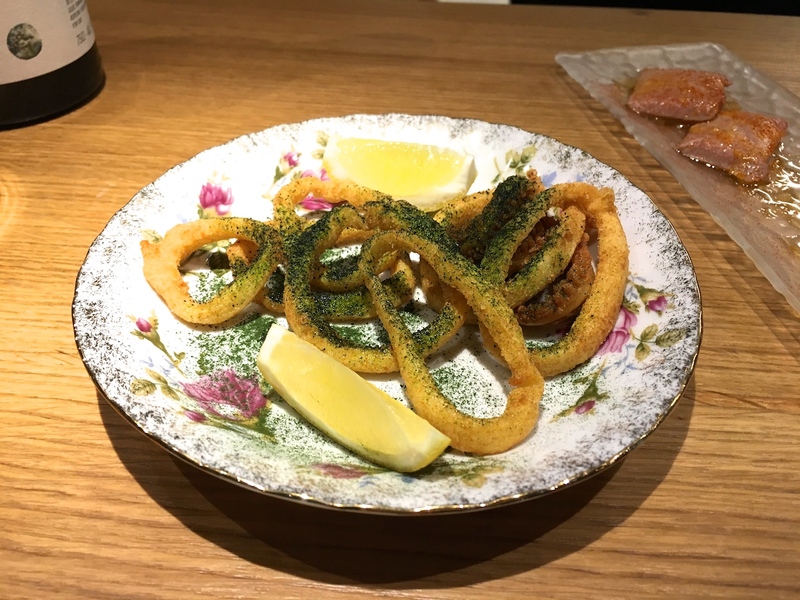 This was shortly after followed by deep-fried, tender calamari (from Cadiz) rings with a nice thin and crisp batter and dusted with algae powder, a pleasing combination. 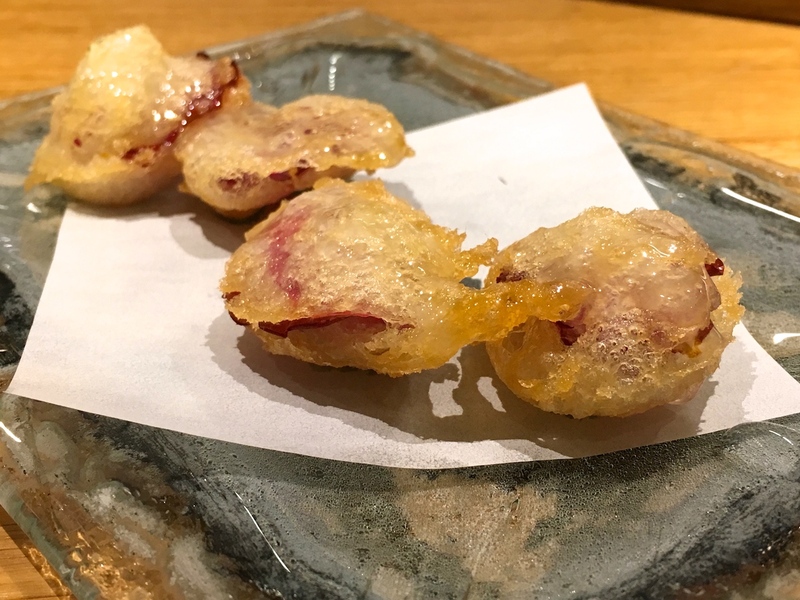 Less convincing were greasy, deep-fried "flatbread" bites filled with Iberico ham and seasoned with rose, which apparently was a variation on the classic Andalusian "molette". Next up was "proto risotto", based on the first ever written recipe of rice, as found in the "El Libre del Coch" cookbook, first published in 1520. 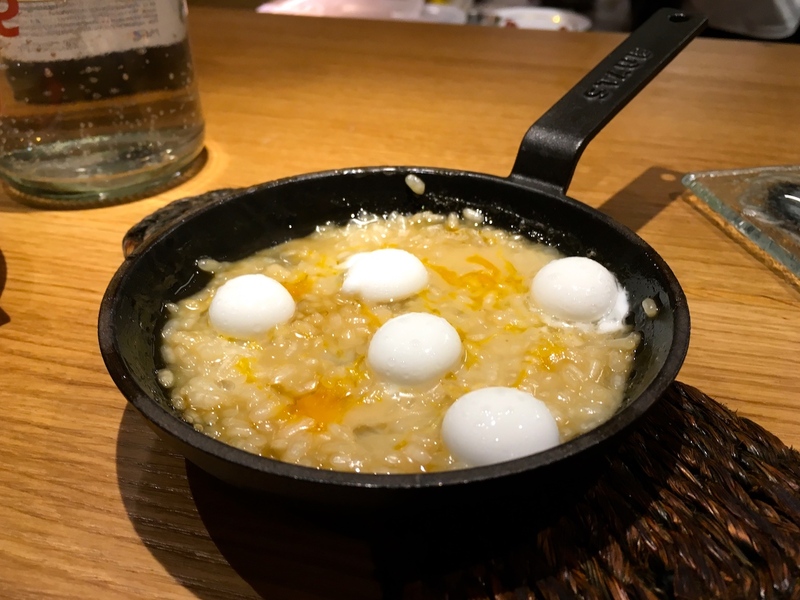 Served in a little cast iron skillet was a delicious risotto-like dish, lavishly flavoured with Jamon fat and thickened with egg. On top of the rice were liquid goat's kefir spheres, which delivered balance and freshness. Even better were incredibly sweet and smoky grilled pimientos (Escalivada), simply served with olive oil and sea salt. Possibly the sweetest and tastiest pimientos I have ever eaten. Simplicity at its best. 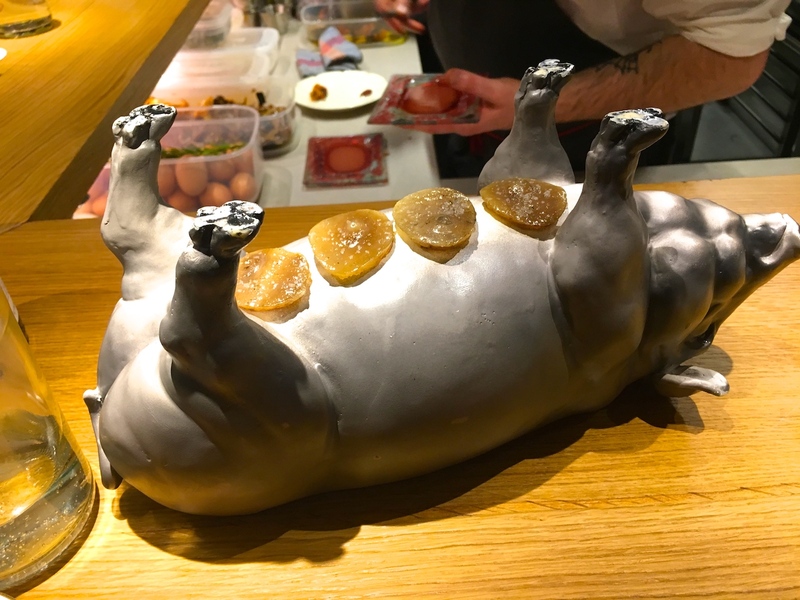 Offal is also featured on the menu at Dos Pebrots, including confit pig's udder, a dish that has quickly found Instagram fame owing to its fabulous presentation. But this is where the fun stopped for me. I didn't like the chewy texture of the udder and flavourwise I didn't work for me either. I think I'm just lacking the Anthony "I love the nasty bits" Bourdain gene. 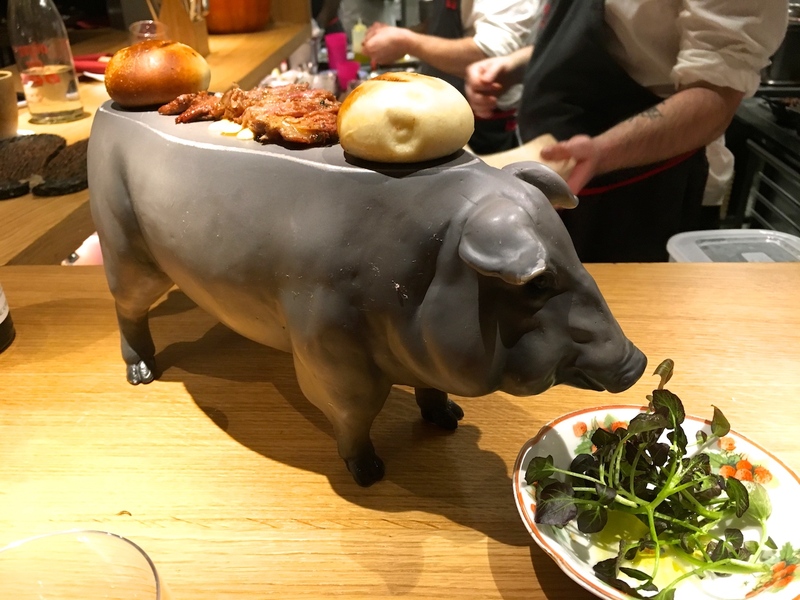 My husband did like the pig's udders and also savoured an oxtail, onion and tripe salad (Salpicon di vaca). The chefs noticed (I was sitting at the counter) that I hadn't enjoyed the udder and were kind enough to serve me another dish that was much more to my liking. 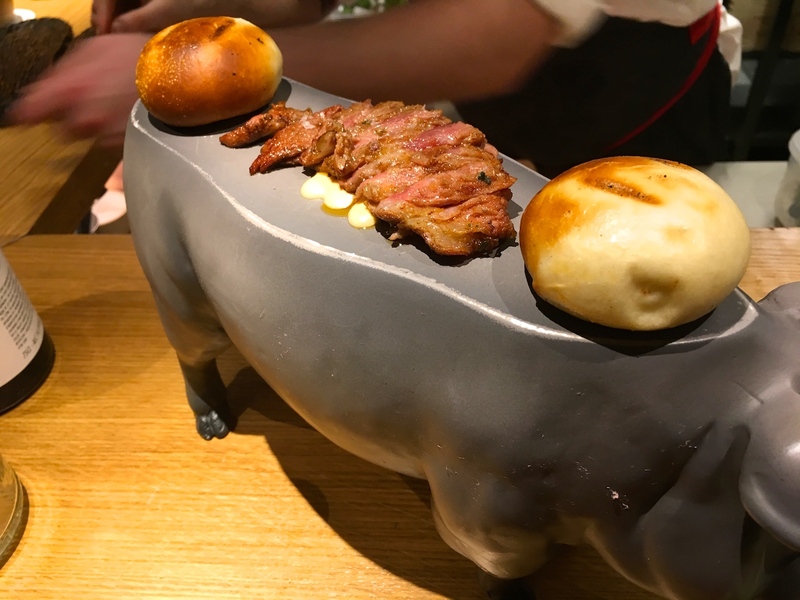 Served on the "back" of a ceramic pig were thin slices of succulent, Josper grilled pork neck accompanied by soft grilled buns and watercress. A delightful dish of beautifully cooked and flavoursome pork and again extra points for the presentation. Two desserts concluded the meal. 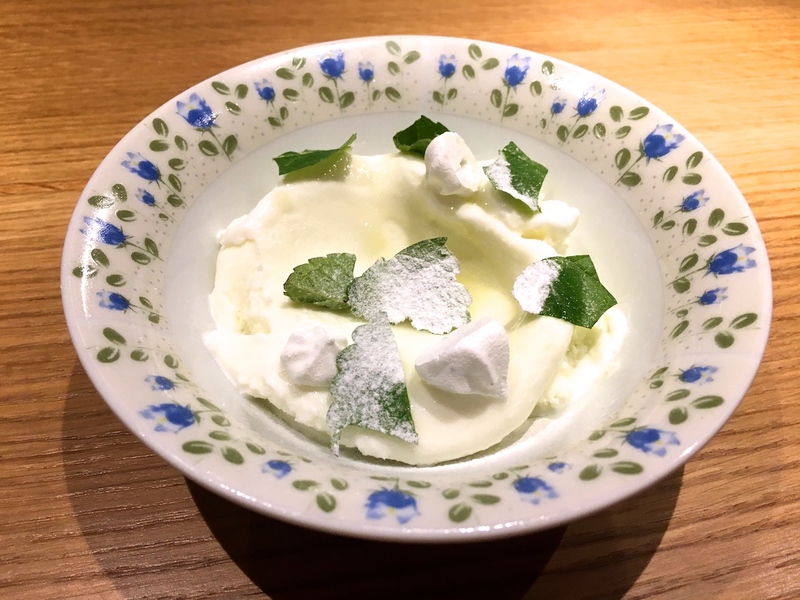 Frozen yoghurt with a sharp citrus flavour, crunchy little meringues and fresh herbs like mint and lemon verbena, was wonderfully refreshing. 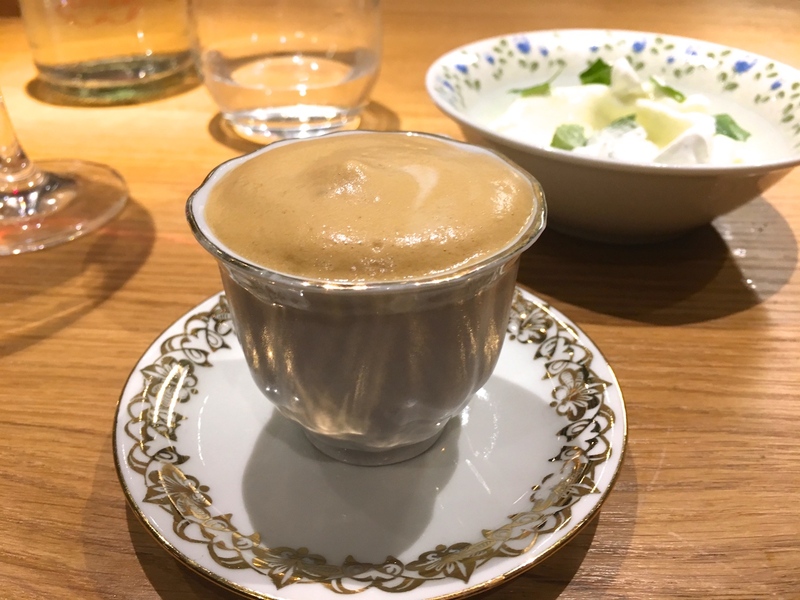 This was followed by an ice coffee and chocolate dessert based on the classic Greek Frappé coffee. Dos Pebrots had only been only been open for 5 months when I visited, and it's clear they've hit the ground running with their upscale tapas and mediterranean dishes with a nod to history. 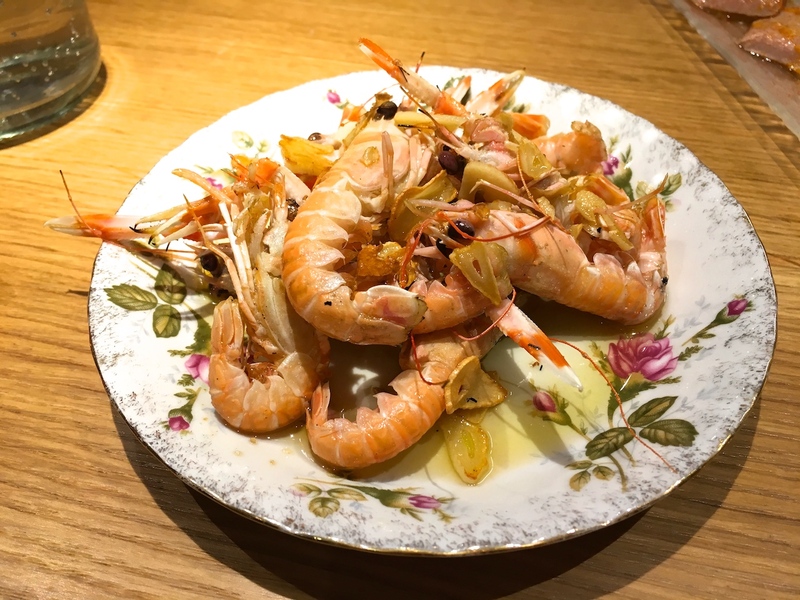 The menu reads like a celebration of Southern Europe's gastronomic past, including the more recent molecular history and offers an abundance of choice. My counter seat offered me great views of the kitchen action - lots of food is cooked over charcoal, which is always a wonderfully mesmerizing sight. With a few exceptions, tonight's dishes were a joy to eat. Good ingredients cooked simply to and great effect. It's a no-brainer, right?